The two peaks and deep valley of NALP’s bimodal salary curves that describe the starting salaries of new law graduates are by now familiar to industry observers. Changes in the distribution of jobs continue to change the look of the curve. While the curve for the Class of 2013 still has two humps, the percentage of jobs under each peak has shifted slightly again, as has the mean or average salary. Since 2006 NALP has published a graphic illustration of the distribution of starting salaries for new law school graduates, a dramatic bimodal curve illustrating that salaries cluster at either side of the average, and that relatively few salaries are near the average. This year’s curve (below) continues this pattern. However, because of a rebound of jobs in firms of more than 500 lawyers that started with the Class of 2012 and continued with the Class of 2013 (see NALP’s press release on the Class of 2013), not only did the average salary for the Class of 2013 shift to the right, but also the bulk under the 2 peaks changed slightly. Jobs paying $160,000 accounted for about 17% of reported salaries, while jobs paying $40,000-65,000 — the left-hand peak — accounted for about half of reported salaries, compared with 16% and 51%, respectively, for the Class of 2012. Nonetheless, just four years ago, for the Class of 2009, the respective percentages were 25% and 34%, with 25% the largest proportion of $160,000 salary jobs recorded for any class to date. Note: Graph is based on 21,545 salaries reported for full-time jobs lasting a year or more. A few salaries above $205,000 are excluded from the graph for clarity, but not from the percentage calculations. The left-hand peaks of the graph reflect salaries of $40,000 to $65,000, which collectively accounted for about half of reported salaries. 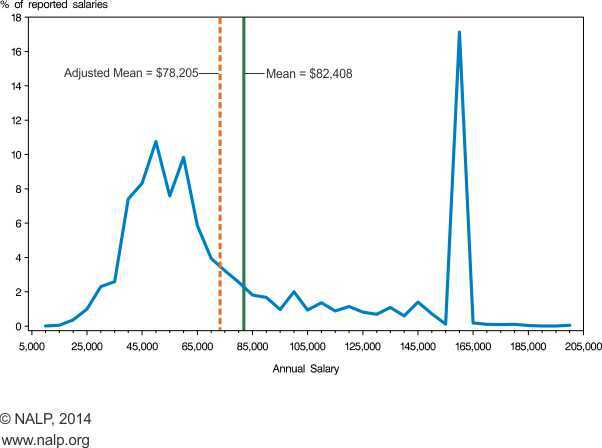 The right-hand peak shows that salaries of $160,000 accounted for about 17% of reported salaries. However, more complete salary coverage for jobs at large law firms heightens this peak and diminishes the left-hand peaks — and shows that the unadjusted mean overstates the average starting salary by just over 5%. Nonetheless, as both the arithmetic mean and the adjusted mean show, relatively few salaries are close to either mean. For purposes of this graph, all reported salaries were rounded to the nearest $5,000.